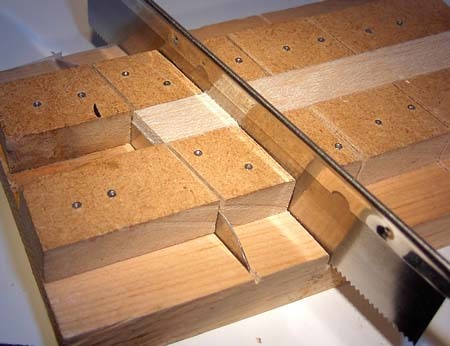 Push the balsa stock through the grooving jig. Check that the groove is deep enough for the humped hook shank. Cut the grooved stock to length and face angle in the jig. The groove should be on the bottom. 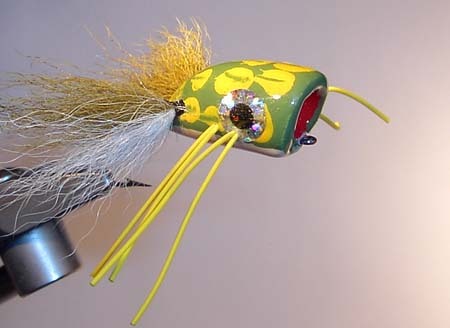 Hollow the face of the popper while holding it in the jig. 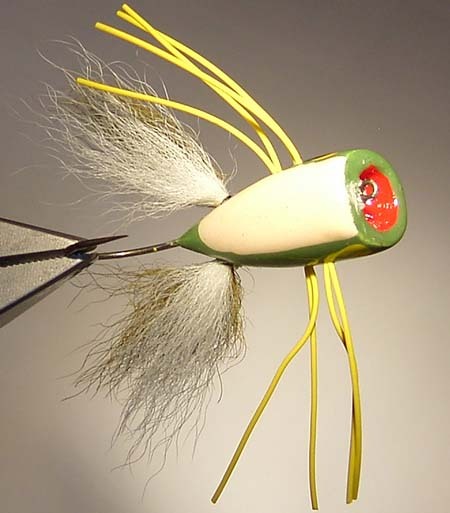 Whittle cut #1: the angle on the back of the popper. Whittle cut #2: on the bottom rear of the popper. Sand the back into a smooth curve. Sand the bottom rear to make a smooth transition to the curved back. Whittle cuts #3 and #4 on the sides of the popper. 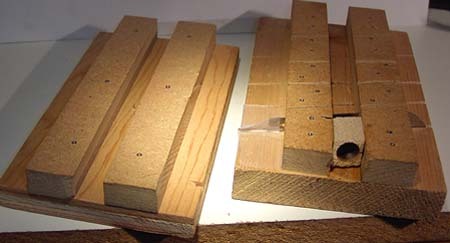 At the rear, the cuts should narrow the stock to about one-eighth inch. Sand the sides to smooth curves. Whittle the four lengthwise corners (cuts 5–8) down as a first step in rounding the cross-section. Sand the popper with a winding motion to make it round and smooth. Check the fit of the humped shank hook again. Deepen the groove with the hobby saw if the shaping of the body has shallowed the groove too much. Widen the groove with sandpaper, if necessary. The hook must fit well. 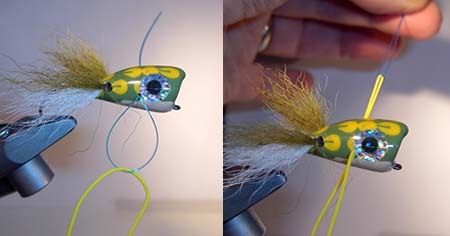 Glue the hook to the popper body. 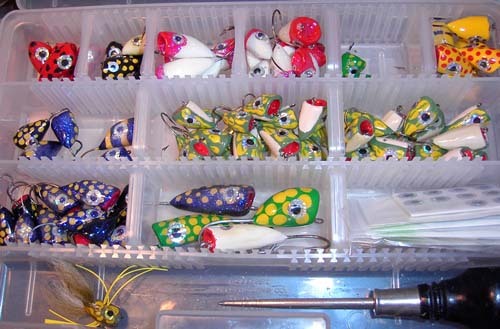 Prepare a batch of popper bodies before mixing the epoxy glue. A beginner will want to make a batch of as few as three; an expert will want a batch of fifteen, maximum. A thread of resin and hardener of about an inch-and-a-half from the syringe-type packaging is enough for fifteen bodies. Put some epoxy in the groove with a toothpick. Position the hook. Add more epoxy over the hook to fill the groove. Sand the bottom of the poppers smooth after the epoxy has cured. Dip and hang to dry in the following sequence. Sand lightly between coats. A drip will form while the poppers are hanging on the drying rack. Knock it off with a toothpick. Paint the face first. Use red or orange Testors. Paint the body as you like. Make eyes by touching a larger nail head dipped in the color of your choice (such as red or yellow), and a smaller nail head dipped in black to make the pupil. Alternative 1: Make eyes by attaching doll eyes with instant glue (cyanoacrylite). Alternative 2: Make eyes by attaching self-stick metallic eyes. For a fish scale effect, spray the sides and back with the color you want the outlines of the scales to be, and let dry. Pull the netting over the back and sides so that you get a close, wrinkle-free covering. Then spray the color or colors you wish on the sides and back. An epoxy coating will protect the finish. A rod-wrapping type epoxy works well. The epoxy coated poppers will need to dry on a slow rotating drum for a smooth finish. 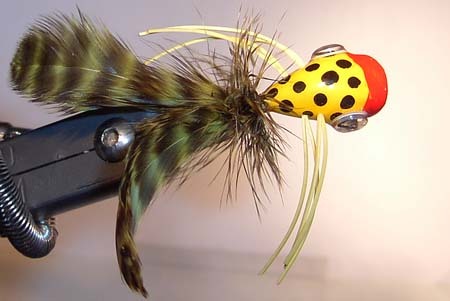 Tie on feather legs and hackle. Tom's preferred method for legs is to make up calf hair legs. 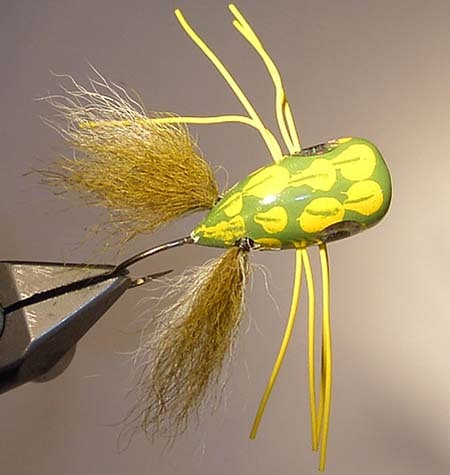 Hold the bunch of hairs in place with hackle pliers until a length of tying thread can be knotted around them. Put a drop of glue on the tied end. Let the glue dry. Cut the legs to length (to the thread tie). 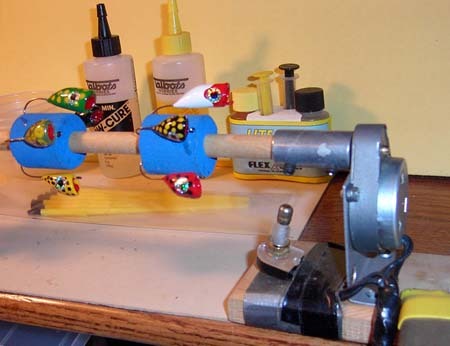 Drill a one-sixteenth inch hole on each side, at the back end of the popper body, for the legs. Angle the holes so that the legs will have a sixty degree spread. Glue the hair legs in the holes with slow drying super glue. Drill holes for rubber legs with a needle for a bit. Push a thin-wire needle threader or mono dental floss threader through the hole; capture the rubber leg material; pull the threader with its entrapped rubber leg material back through the hole. Position and trim to length.